The Pokémon in digital artist Michelle Zhu's paintings are so cool and relaxed, that I would just leave them to themselves and wouldn't try to catch them at all. 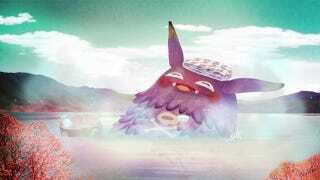 This one above is a special mixture of Pikachu and Koffing, and he's having a great time. Note: Mildly to moderately NSFW artwork follows. An Onix, a Vileplume and a Seaking, drawn in a different, but still cool style. And this Chansey is just... interesting.